Image based on a flag flown outside a Copenhagen hotel one morning in 1998, and in Oulu, Finland, in 2001. 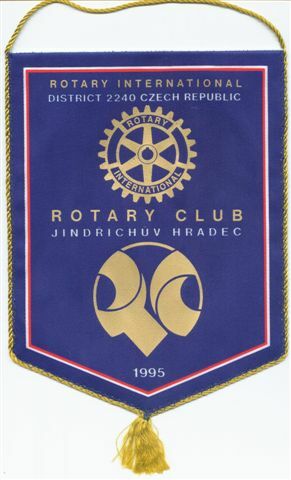 Rotary International officially adopted its flag during the 1992 Congress in Dallas (Texas). The flag is made of a white field with the official wheel emblem in the middle. The four parts of the wheel rim are royal blue. The words ROTARY and INTERNATIONAL, in gold, are placed in the upper and lower parts of the rim, respectively. The wheel hub and cotter pin slot are white. The first official flag of Rotary is said to have been displayed in Kansas City (Missouri) in January 1915. In 1922, admiral Richard Byrd, member of the Winchester Rotary Club, brought a small flag in his expedition to the South Pole. He did the same in 1926 when he went to the North Pole. 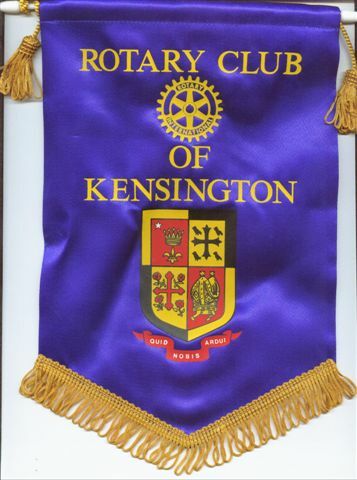 Some Rotary Clubs use the official flag as club pennant during their meetings. In such instances, it is allowed to add above the wheel ROTARY CLUB and below it the city, state or country name. 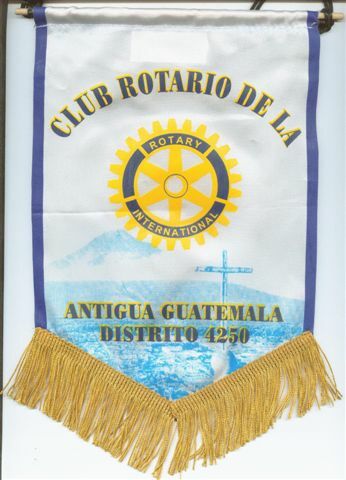 The official flag is permanently displayed in the seat of Rotary and during congresses and official events sponsored by Rotary International. The image shown on this page matches the official description but has a yellow border all around not mentioned above. Unfortunately, the site mentioned above does not show the flag. emblem in the middle, whereas the flag used in practice (at least as seen in Denmark and Finland) has a yellow border. 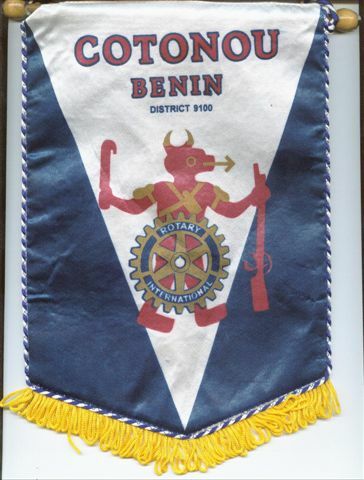 Probus, all have their own distinctive emblems and flags, all incorporating some aspect of the Rotary wheel. - 1926: The current emblem is adopted. Rotary International is said to have used a flag since January 1915, therefore there was probably a change in the flag in 1926 when the emblem was changed. Seen in association with a Rotary conference at Saint John, New Brunswick, Canada, a blue-white-blue horizontal triband, with the Rotary emblem on it. During the two days I was there the wind was consistently blowing from one direction, and I got a very good look at this back of the flag, from which I drew the above image. A few days later Luc Baronian checked it out again - the front has the dark blue + yellow wheel with ROTARY INTERNATIONAL spelled out. The Flag of the Rotary Club of Tirana has been designed by an Albanian designer and was presented officially on the Club's Constitutional Day - 11 May, 1992.
located by Gordon White, 13 December 2004.